It was the third year in a row that Leicester has hosted the opening event of the HEAD UK-Racketball Series and once again the event was a great advert for competitive racketball at one of the UK’s friendliest clubs. Local hero Dave New progressed through to the semi finals for the first time in the A Grade with an early victory over top seed Mark Fuller seeing him pick up enough points despite a close defeat to Dan Soar. Two seed Luke Bishop progressed in group B without dropping a single game defeating experienced racketballer Jason Russel 2-0 and local Leicester first team player Jason Gollaglee. Despite huge local expectations on Dave New in the final he did not have enough to overcome Luke Bishop who’s hard an accurate hitting earned him another HEAD UK-Racketball title to add to his growing collection. It was another great entry for the B grade with 20 competitors battling it out for the title. Group A was tight with Dan Hall only just overcoming the challenge from top seed Lee Sadler 2-1. In the second group experienced competitor Ryan Loska once again progressed to the semi finals of a HEAD UK-Racketball tournament without dropping a game. Sam Booth came second in group B defeating Gavin Burton 2-1. In group C Kasey Hall overcame the challenge from Leicester’s shot playing junior Simon Herbert in his opening match of the day. He probably did not expect to be pushed quite as hard by the youngster but managed to settle and see off the challenge. The final two group winners had to win both the group and then a quarter final to earn a place in the semi’s. Local unseeded player Luis Martins came through group D with experienced racketballer Neil Bowyer doing the same in Group E. The quarter finals went the way of the experienced racketballer against the local hero with Neil Bowyer progressing to the next stage. The semi finals went the way of seedings with Ryan Loska and Kasey Hall both winning semi finals. After a long day’s racketball for both competitors it seemed that Hall was feeling the matches more than Loska as the final started. Hall does not lose many matches in the B grade at HEAD UK-Racketball tournaments but he did not have enough that day with Loska running in a comfortable winning 2-0. A three way round robin group decided the women’s event. Nicky Green and Nina Parker both defeated Vicky Toates 2-0 but both matches were much, much closer than they were a year ago! The final was a great match with Nicky Green only just overcoming the challenge from Parker 2-1, 11/9 in the decider. Three matches for every competitor would decide the Over 40’s. Both Adam Grilli and Andy Wood defeated Brendon Bennett and Tim Booth 2-0 to set up a much anticipated final between the two experienced tour players. As expected it was a close battle and on this occasion went the way of Grilli 2-1. It turned out afterwards that Andy Wood had been playing all day with a fractured elbow! A good entry into the Over 50’s saw a three group split with the winner of each heading into a deciding group to fight it out for the title. The events top seed Patrick Osborn came through group A without dropping a game with Spencer Cooper finishing second after a narrow victory against Paul Halstead. Group B was very competitive with all competitors scoring points on the board. Charlie Graddon came in 4th despite a victory over Stephen Widdison who picked up points against all three of his opponents. The group was settled by a contest between top seed Lee Sadler and Rob Watkins with Watkins coming through as the eventual winner 2-1. In the third group of the day veteran UK-Racketball Series player Michael English once again proved his resilience and secure a place in the final. It was always going to be a hard fought final group with three very experienced and competitive racketball players. Both Patrick Osborn and Rob Watkins defeated Michael English to set up the much-anticipated final. After losing a controversial first game Osborn quickly managed to establish himself in the second and from then did not look back winning 2-1 and taking another HEAD UK-Racketball Series Over 50’s Title. A injury and subsequent late withdrawal from usually ever present Graham Greensall lead to a uneven draw in the Over 60’s with players in group A having to compete in one less match than those in group B. Richard Waller capitalized on this to take the group without dropping a game. Second place was a three way tie between Ed Smith, Derek May and Greg Marsters who all defeated each other. Group B in the Over 60’s was one of the largest and most competitive groups of the day. Roy Burns defeated all comers with local legend Hans Bilson taking second place. The final went the way of the fresher of the two competitors with Waller defeating Burns by 2 games to 1. Another good entry and competitive draw in the over 60’s! Not to many changes to most grades but a major change to the Over 60's. Schedule and match times will be uploaded soon. 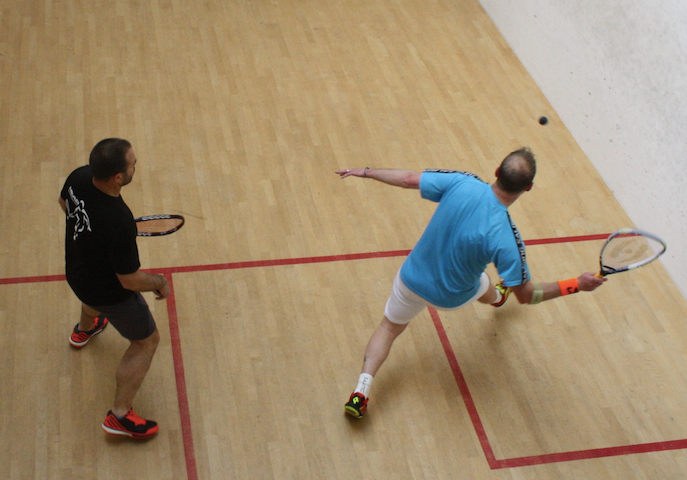 Follow this link to see the entry list for the Leicester Racketball Open. Great to see so many people taking part again. I will email through tournament information including food and breakdown of draw release dates as soon as possible. Fantasy Squash, UK-Racketball's sister company, run the coaching and events at Leicester Squash Club. We are hoping that like at our other lead centre Nottingham this will lead to a high level of local interest! As well as being a UK-Racketball base the club is an obvious choice for the event, being one of the largest clubs in the Midlands. Close to the M1, it has great transport links to the whole country. The event last year saw some surprise winners along with a few familiar faces. Leicester Squash Club is committed to developing and promoting squash and racketball. In 2014/15 the club ran a PSL side for the first time with the team finishing in 5th place. This year the side has got off to a flying start and is currently top of the league 7 matches in! Take a look at our video for Everards Leicester PSL team and the Club: https://www.youtube.com/watch?v=0IlgWNabASQ. Hopefully this event will once again be a fantastic start to the Series! The club has 5 well maintained courts, a modern gym, a welcoming and cosy bar area and a passionate membership. 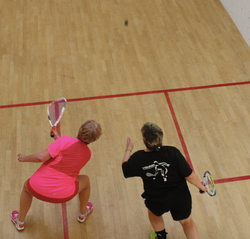 For more travel and club information call the Club on 0116 270 8068 or visit Leicester Squash Club's website at http://lsc.mycourts.co.uk/index.asp.